A method for dynamic presentation of a plurality of planar objects, comprising: using a processor device operably coupled with a memory, said memory comprising computer-executable instructions performing: generating an interface on a user device, said interface comprising a display of user-selectable interactive features manipulating the planar objects; receiving a selection of a user-selectable interactive feature; and enabling the selected user-selectable interactive feature on the user device. …generating an interface on a user device, said interface comprising a display of user-selectable interactive features manipulating the planar objects; receiving a selection of a user-selectable interactive feature; and enabling the selected user-selectable interactive feature on the user device. – through which a person can and does somehow change the trading cards with a computer program on the computer/smartphone/tablet/phablet/Speak-and-Spell/whatever. Wait, it's just a method of displaying multiple trading cards and allowing a user to change those cards somehow? Why didn't they just say that? And, I'm sorry, but Yahoo's program doesn't seem patentable because I'm pretty sure there have been other programs/apps/websites/patents that have offered similar services (for years in fact). Since patents are supposed to be limited to inventors who invent something new, I don't think Yahoo will get a patent on this. 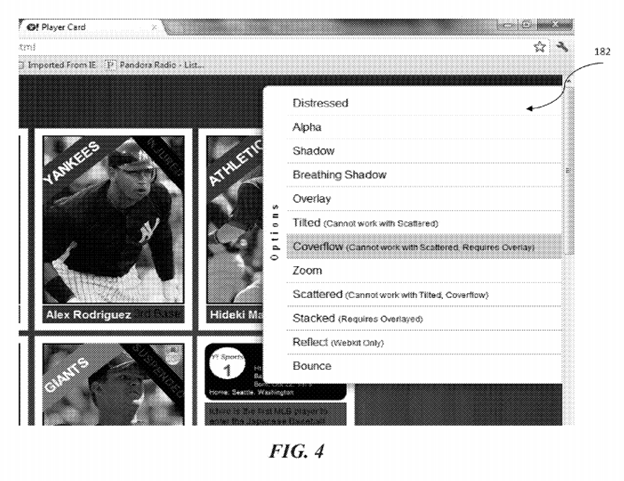 As cards can be entirely dynamic, users may be able to collect series of virtual cards just as people have collected baseball cards for years. Their interactions are unprecedented and offer a unique, new and engaging way to interact--giving incentive to both collect cards and engage directly with the content. One way to engage with the content is for a user to click on any card to flip it over. The "flip side" of the card reveals ancillary information such as a player's stats, hometown, and the like. Here you will find information not included in the primary display. I mean, with Yahoo's program, you can flip the card on the computer just like you would flip a card in real life? Can you see me clicking repeatedly on the sarcasm button here? And wouldn't a "sarcasm button" actually be more of an "unprecedented" invention? Yahoo's application also provides pictures that show off the "unprecedented" interactions performed on virtual trading cards. So if I'm reading that drop down menu correctly, a user can change a card by distressing it, shadowing it, doing something to it called alpha-ing, applying something called a breathing shadow. Thankfully, Yahoo defines each of the options. Distressing "provides an 'aged' appearance to the cards." Whew, I'm glad it only ages the appearance of cards, because I was worried "distressing" would make the virtual cards nervous. But really, "distressing"? Is that what collectors want? Electronic trading cards that should be impervious to the elements, somehow changed so they grade at a lower level? "Alpha--with this feature enabled, the cards become opaque"
Oooh, non-see-through cards. Just like in real life. "Shadow--with this feature enabled, the active card appears to be lifted off the surface, in a faux three dimensional (3D) space." Just like, in real life, when you pick up a card and it makes a shadow on the desk, you can now do that on your computer. Unprecedented! And my favorite interaction, the "breathing shadow." No, it's not a creepy guy hanging around alleyways wearing nothing more than a trench coat. It's a function that allows a user to make "the shadow around the active card…pulsate slowly." Other "groundbreaking" functions allow a user to "tile" and "tilt" their cards and, get this, "zoom," as well as "bounce" which is defined as "with this feature enabled, the active card appears to 'bounce.'" I'm sorry, I've hit the patented sarcasm button so many times during those last few paragraphs it's broken. Despite my mocking, what should electronic trading card manufacturers think about this patent application? I don't think you should worry, but you should watch. According to the Patent Office website, an Office Action (aka an initial rejection) was sent Yahoo's way on March 13 rejecting all of the claims in view of prior art. So, Yahoo won't get a patent on its first pass through. To make a prediction, if Yahoo somehow does receive a patent at some point, it's unlikely to be this broad. Yahoo will need to overcome a lot of prior art already cited by the Patent Office. And that prior art does not even include Wildcat's electronic trading card patents, which not only predate this patent by 15 years, but were also litigated against, basically, every trading card manufacturer out there for their own virtual trading card products. Given the variety of older virtual card products out there, I don't think this patent application stands much of a chance. Although, maybe there's room for a Yahoo patent on the "breathing shadow." I'm pretty sure no one ever did that with a card before. And I should note to Yahoo, your program might actually be fun and/or useful. It's just, please, from now on, try not to use the word "unprecedented" to describe an invention that's been around for years now, OK? BGS 10 PRISTINE KRIS BRYANT 2015 TOPPS RC #D 99 AUTOGRAPH ON CARD CUBS MVP ?